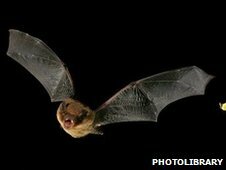 Reintroduced beavers construct ideal habitats for bats, new research reveals. By felling trees, beavers thin out the canopy, scientists have found, leaving fewer obstacles in the way of aerial-hunting bats as they pursue insects. Also, river-damming by beavers boosts the numbers of these insect prey by creating large waterlogged areas. Scientists say this study provides further evidence of beavers' essential role in maintaining woodlands. The European beaver was reintroduced to forest areas of northern Poland between 1943 and 1986, having previously become extinct in the area a century before. Beavers are known to extensively transform the environments in which they live by felling trees for food and building dams. But previous studies have largely been limited to how beaver activity can effect species living on or in the water, including waterfowl, amphibians and crustaceans. 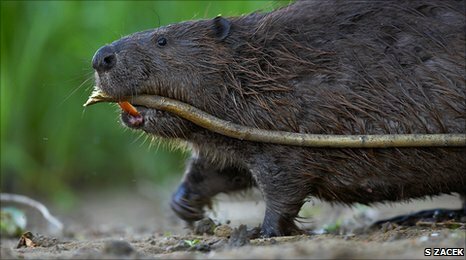 So researchers from the University of Gdansk, Poland aimed to study the effects of beaver activity on species less obviously connected to wetland habitats. 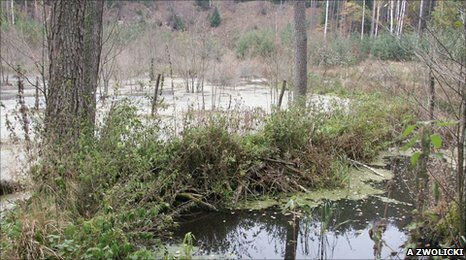 Beavers' dams flood nearby areas to the benefit of bats. In findings published in the European Journal of Wildlife Research, Mateusz Ciechanowski reports benefits for insectivorous bats sharing habitat with beavers. In particular, aerial-hawking bats including common pipistrelles (Pipistrellus pipistrellus), Nathusius' pipistrelles (Pipistrellus nathusii), soprano pipistrelles (Pipistrellus pygmaeus) and common noctules (Nyctalus noctula). "Bats are very skilled fliers, but those species who hawk prey in the air, cannot effectively hunt in a very dense forest," says Mr Ciechanowski. Aerial-hawking bats hunt by echo-location, bouncing sound off their prey and listening for the echo, which identifies its location. Mr Ciechanowski explains that in dense forest the echoes of insect prey are "cluttered" by echoes from branches, making hunting less effective. In areas where beavers have felled trees whilst foraging or to build dams, aerial-hawking bats are thought to capitalise on the canopy gaps to catch more prey. Likewise, beavers flood stream valleys when making dams which create waterlogged areas favoured by bat prey such as midges (Chironomidae). "Forest that was both flooded and subjected to beaver 'logging' supported the highest bat activity," says Mr Ciechanowski. The research team found that bat species that hunt near water surfaces did not benefit as much as was expected. "We were astonished, that beavers... 'could not help' Daubenton's bat, i.e. the species most strongly associated with water bodies," says Mr Ciechanowski. Daubenton's bats (Myotis daubentoni) forage over flat water that acts as an "acoustic mirror", reflecting that bats' calls to reveal the location of insects on or above the water's surface. Narrow streams in woodlands are too small and changeable for this method of hunting but researchers theorised that beaver ponds created by dams would provide excellent conditions. "Unfortunately, young beaver ponds are known to cover fast by duckweed and the duckweed is known to produce complicated echoes, masking echoes reflected from the body of flying insects." Early beaver ponds often have duckweed on the surface. "This was the case of one our study valleys - pipistrelles and noctules did not care about duckweed, because they hawk prey in the air, far from any background, but almost no Daubenton's bats were recorded there." Mr Ciechanowski believes this study complements conservationist's arguments that beavers are an essential or "keystone" species in woodland habitats. "It simply supports the idea of beaver reintroduction... not only for that magnificent animal itself, but also as a tool to restore habitats biologically depauperated by ourselves."